Group fitness participants regularly request ab workouts, but it can get boring to do the same crunches and sit-ups each class. One of my favorite ways to add variation is to do ab workouts using equipment that’s normally collecting dust in the corner. We rarely use stability balls, because they take up a lot of room during class and most gyms only offer a limited supply. If you choose to teach ab workouts and you’re using a limited supply of stability balls, you can ask participants to pair up, or incorporate stations. Here are four stability ball ab workouts and tips on how to cue each one. Ask your group fitness members to lay on their back and place the ball between their calves and ankles. Depending on the size of the individual, the ball may take up more or less space between their legs. And if participants want to modify, they can also put the ball lower between their knees for a shorter “lever”. Then, participants will keep their legs straight as they lower their feet towards the floor. At the same time, lower your hands towards the floor. After, raise the feet and arms back towards the ceiling, and grab the ball. Then, everyone will do the reverse, holding the ball as it lowers towards the floor and bringing feet towards the ground. You can easily transition participants from The Rainbow into this next exercise. Ask participants to hold the ball in their hands, lying flat on the ground. Notice that the ball is directly over their shoulders. Then, members will sit straight up, and hold the ball over their shoulders once more. From there, they’ll come back down to the floor. As participants improve, their goal is to keep their legs on the ground the whole time, arms and backs straight. It’s important to keep in mind that we always want to balance our exercises. If we do a lot of abdominal work, we’ll want to turn over and exercise our lower backs, as well. These next two exercises are not “ab workouts”, but they will help balance out our core by strengthening our lower backs. Have participants lower themselves onto the ball so that their lower tummies and hips are resting on the ball, legs are extended out behind them. If they’d like, they can press their feet against the corner of a wall to help stabilize them. From there, place your hands by your face, with elbows out towards the side walls, and lift your chest and head a few inches higher by squeezing your lower back muscles. You’ll want to think of your body like a “V” instead of a “U”, so don’t think about curving your lower back and pulling it towards your gluts. Instead, think about raising your head toward the ceiling. Once you’ve mastered the Modified Superman, then you can progress to the traditional Superman. It’s the same thing, except this time your arms are extended out in front of you like Superman. Ask participants to straighten their arms as much as they can. There are so many different ab workouts you can do with a stability ball. Check back in on Wednesday for more ideas. If you liked this post, you’ll also like the tricep and push-up exercises. For the Group X instructor that grew up in dance or gymnastics class, you may be familiar with across the floor. That’s when the entire class lines up on one side of the room and takes turns doing a dance move or activity as they progress towards the other side of the room. Across the floor is great for Group X, as well, since it gives participants more room for their exercises and use their muscles in a slightly different way than they would stationary. If your class runs on the smaller side, you might be able to cue exercises across the floor with the entire class since there’s room for everyone. But, I’ve found it difficult to cue exercises across the floor in small studios or larger class sizes. Participants tend to run into each other and they spend a lot more time standing around waiting for others to finish. Instead of having all participants focused on one move across the floor, I’ve started using a different across the floor technique. To improve the across the floor experience in larger classes, divide members into two groups. Either ask the participants to pair up, or draw an imaginary line in the middle of the room and assign a Group A and Group B. From there, ask the first group to start an across the floor routine, such as lunges across the floor with a shoulder press with each lunge. I like to mix it up and cue a different exercise each time they go across the floor. Then, you’ll lead the second group in a different exercise against the wall. One option is the wall sit. Ask that second group to find a spot on the wall, and lower their upper body down so that their hips and knees are both in 90 degree angles. Really encourage participants to get their hips low, since many will start to creep up. The other option is a plank against the wall. The second group can all push their toes against the wall and then scoot their arms out until they’re in a full plank. Then, you are able to lead both groups at the same time. You can cue the first group to hold one lunge in an isometric hold at the bottom, then switch. Or, you can switch back to the second group and instruct them to do slow mountain climbers in their plank. Once the first group goes across the floor (there and back), and arrives back at their starting point, the two groups switch. Group A will then do the plank or wall sit and Group B will do across the floor. Once participants have done this one or two times, they’ll be more familiar and will be able to quickly get into position to do across the floor. Some classes love to have a different experience each class, and will embrace the across the floor exercises. You may find your class just doesn’t like to move from their stationary position in the middle of the floor, and that’s okay, too. Every class is different. Group X instructors love Halloween — it’s one of the most common themed classes all year. But, let’s be honest, if I have to hear Monster Mash one more time, I’m going to rip my ears off. Most of the traditional Halloween workout songs are cheesy and overplayed. So, it’s up to us instructors to add a twist to the traditional Halloween playlist, so participants (and instructors alike!) aren’t moaning and groaning like goblins. Here are a few ideas to mix up your Halloween workout playlist. As a kid, the best part about Halloween was all the candy. Lucky for us, there are so many good songs out there about that sugary or chocolatey goodness. Let your participants know that your Halloween playlist is going to be sweet this year, and then let your workout songs do the talking. As an adult, Halloween is all about the costumes. Feel free to broaden the playlist a bit to encompass anything related to dressing up. Feel free to combine these or choose a couple workouts songs to start with and then make it your own. While participants will appreciate you mixing up the music, they mostly just want to hear some good tunes that makes them want to work out. So, feel free to loosely interpret the theme you choose, and pick music that inspires you. For more workout songs, check out the workout routines and playlists page. 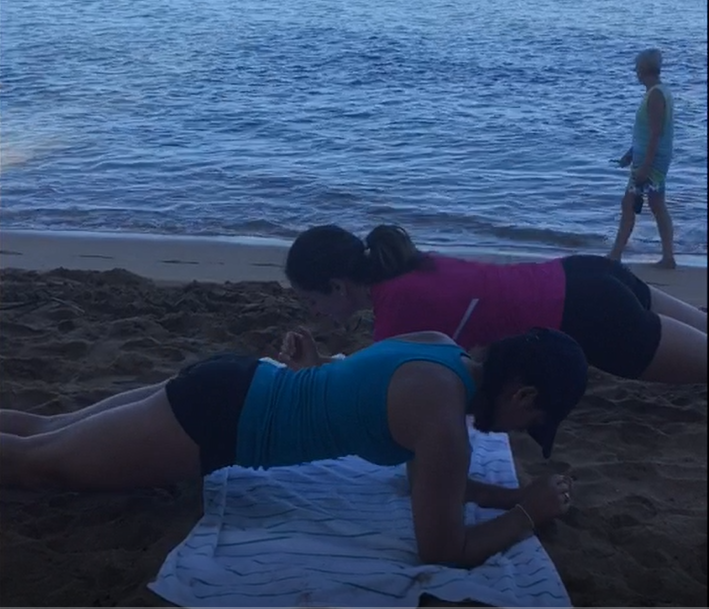 Earlier this month, my family went on a trip to Maui, and we were sure to fit in a few self-run boot camp classes while we were there. Since Group X participants are always requesting ab exercises in class, I enlisted the help of my family to showcase a few ideas you can try in your next class (beach optional :)). Here are two ab exercises worth considering for your next group fitness class. My friend and I partnered up to show the Up & Down Plank. Start on your elbows and toes. If you’d like, you can also be on your knees. Just make sure your body is in a straight line from the shoulders to the ankles or knees. From there, you’ll want to press up onto your hands, trying to keep your hips square to the floor. Continue to press up and down, switching the hand you start with each time. Put your hands under your hips, then straighten your legs out in front of you. Make sure your legs are about one to two feet off the ground – keep them pretty low to the ground. Lift one leg about six inches higher and then switch, bringing that foot back to the starting position and the other six inches higher. Make the movement fast, small and quick. If you’d like an extra challenge, cross your arms over your chest instead. For a modification, don’t straighten your legs all the way. These are great ab exercises and workouts to do in your next group fitness or Group X class. They’re especially challenging if you include them in a back-to-back rotation of different exercises. For more exercise ideas or workout routines to try, check out the workout routines and playlists page. On days when you don’t feel like working out, you can pop in your headphones, turn on a few motivational songs and sometimes that alone will help you embrace your workout head on. I love how important music can be to a good workout. Pairing the right song with an exercise can take it from just okay to amazing. I’ve previously shared song ideas to help ease the transition for members from summer to fall. Now, let’s take a look at songs that will help inspire participants to notch up their effort level. Some of these motivational songs use powerful lyrics to motivate listeners and encourage hard work. Others made the list because of their powerful beat. Either way, this list is filled with songs that will motivate members to work harder, go farther and faster. Use these next time your class needs some new motivational songs to help them give that extra effort. For more song ideas, check out the spin class playlist “Climb & Sprint” combo. I like to get the biggest bang for my buck when I strength train. So, I’ll often do compound exercises, which involve more than one muscle group to get a full body workout faster. I typically take a similar strategy in my Group X classes. Since weights in group fitness studios are usually lighter, they work well for endurance strength exercises engaging upper and lower body at the same time. As you know, there are so many ways to work the same muscle, and now here’s a look at how to work more than one muscle at once. What’s great about most compound exercises is that you can add in options to support many different fitness levels. My favorite compound exercises involve two doing two exercises simultaneously. So, when teaching these to your class, let participants know the simplest way to ease into it is just to do one of the two movements. To do a plie squat, point your toes towards the corners of the room, making sure that your knees are comfortable the whole time. Then, you’ll bend at the knee to lower your hips. Your goal is to get your hips in line with your knees, so that your legs look more like a box than a house. Keep the shoulders over the hips the whole time. The shoulders DO NOT come forward like they do in a traditional squat. Adding on, participants can start to do a bicep curl as they come down. Other options include bringing the feet together while doing just bicep curls, doing the compound exercises without holding dumbbells or just doing the plie squat. On your last one, hold the plie squat at the bottom and pulse the bicep curls up towards the ceiling. You can also pulse the curls toward the wall in front of you. Or, hold the curls and pulse the legs. Then, you can transition to doing plie squats with an isometric bicep hold. You can also do this vice versa with an isometric plie hold and bicep curls. After the plie lunge sequence, plant one foot forward and one back, ready to do lunges. Start lunges, keeping both knees between your toes and feet wide apart. Also think about bending that back knee. Both knees should be in 90 degree angles. And, shoulders are still right over the hips, NOT leaning forward. From there, add a side lateral raise with a dumbbell in hand. Keep your elbow slightly bent and raise your arm to the side. Your arm should come roughly to shoulder or ear height. Make sure that you’re not bending your elbow too much. Hold your weight(s) so that your hands are right next to each other at your belly button. Sink into an isometric lunge, holding the lunge when your legs are in 90 degree angles. From there, bring your weights up overhead to do tricep extensions. Bending at the elbow, bring your weights behind you, pointing your elbows towards the wall in front of you. Then, extend your arms overhead, keeping your elbows in the same spot the whole time. Your options here are just to do the isometric hold for the lunge, or just tricep extensions. You can also play around with using one weight or two. Since this full body workout focuses on compound exercises, it’s a quick one to complete. This is a great opportunity to work a ton of muscles at the same time in your Group X class, so that participants get a lot out of it. For more exercise ideas, check out the workout routines and playlists page. This summer is flying by. Before we know it, we’ll be trading in our long, hot days for school work, falling leaves and crisp, cool mornings. The changing of the seasons is a great time to add some new tunes to mix up your Group X playlist. A few months ago, I shared a few workout songs to try around the Memorial Day holiday. Now, here are ten workout songs that fit an end of summer theme to play in an upcoming group fitness class. These end-of-summer workout songs includes songs about school and songs about the upcoming Fall season, because those are the two major things we get to look forward to in the near future. “Rock and Roll High School,” The Ramones — fast-paced, upbeat song that’s good for a sprint. “ABC,” The Jackson 5 — a family fun song with a slower speed but tons of energy. “Another Brick in the Wall,” Pink Floyd — a steady moderately-paced song that will give your playlist some edge. “Don’t Stand So Close to Me,” The Police — a nice buildup for a climb or slower song. “Teacher,” Nick Jonas — fun, upbeat pop song with a moderate beat that’s good for strength training. “September,” Earth, Wind & Fire — I don’t know a single person that doesn’t love this song. A must for any fall-themed playlist. “Falling for You,” Student Rick — A fast rock song with a bit of punk that will have you itching for an interval. “DJ Got Us Fallin’ in Love,” Usher feat. Pitbull — a high-energy pop, Top 40’s song that will fit in a bunch of different playlists. “Free Fallin’,” Tom Petty — A classic slow jam that will have everyone bobbing their heads during cool down. “Fall For You,” Secondhand Serenade — A great, slow love song that’s a perfect cool down song.